Ameren and ComEd are making more than $3 billion in upgrades to the power grid, including installing new advanced electric meters, also called “smart” meters”. Here are the top five things you need to know about those new meters. No. 1: What is a Smart Meter? 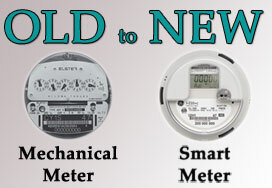 The technology behind our old electric meters dates back to the time of Thomas Edison. Since our very first power bill, we’ve been denied the kind of usage details that could help us cut costs. Instead, the only information we’ve been given is the total amount we use each month. Your new digital meter is the first step toward changing that. It can transmit usage information to you and the utility almost instantly. Not only does that make it much easier for the utilities to bill you more accurately, but it also gives you access to much more information. No. 2: How Will I Know I’ve Got a New Meter? The utilities will notify customers in a number of ways: by mail, phone call (for ComEd customers), and even a knock on the door when a neighborhood is due for new meters. A utility worker or contractor with a uniform and appropriate ID will replace your old meter with a new one in the same spot. If you have any questions about the worker or the meter, call the utility, at 1-866-368-8326, for ComEd, and 1-800-755-5000, for Ameren. The whole process should take about 10-15 minutes, and may include a brief interruption of your power. Afterwards, the meter number on a ComEd bill will begin with a “2.” The new meters in Ameren territory will have a yellow sticker. No. 3: Do I Need to Do Anything Before I Get the New Meter? You don’t have to do anything in advance of getting the new meter. As long as the old meter is outside and the utility can safely access it, you don’t need to be home when the new meter is put in. The technicians will do a safety check, and if they find a problem will postpone installing a new meter until any potential safety hazards are addressed. Not sure when you’ll be receiving a smart meter? Call ComEd, at 1-866-368-8326. In Ameren territory, click here or call 1-800-755-5000. No. 4: What are the Potential Benefits of a Smart Meter? New choices. Most of us pay a rigid rate for electricity that hardly ever changes. But smart meters break that mold, opening the door for flexible, money-saving electricity plans, such as hourly pricing or peak-time rebates. Hourly pricing, offered by ComEd and Ameren, charges you electricity rates that change by the hour, allowing you to take advantage of the times of day when power prices are extremely low. Also, ComEd’s Peak-Time Savings and Ameren’s Peak-Time Rewards programs allow participants to enjoy bill credits if they don’t use heavy amounts of electricity during certain designated “peak” summer hours, when power demand is high. Estimated billing eliminated. The old meters were supposed to be read in-person each month, but regulations allowed the electric utilities to skip readings and estimate usage. Unfortunately, the estimates were often inaccurate, leading to big make-up bills and consumer headaches. The new meters, with their ability to easily transmit meter readings to Ameren and ComEd, should all but put an end to estimated bills. Reliability improved. The new meters and other grid improvements will help notify the utility of a power outage much more quickly, and even reroute power to avoid costly, widespread blackouts. Efficiency Improved/Waste Reduced. All customers pay for wasted power that is not charged to a particular account. For example, vacant office buildings that continue to use electricity in downtown Chicago cost consumers about $35 million a year. The new meters would allow the electric utilities to turn that power off. They also would help cut down on electricity theft and unaccounted energy—such as when a customer moves into a new home and uses power before the account has been opened. Lower power prices. If special power pricing plans and other “smart grid” improvements can reduce “peak demand”—the busiest part of the day when businesses and homes devour the most electricity—they can help lower power prices for everyone. No. 5: When Can I Start Saving? You don’t need to wait for your new meter to begin saving money. Ameren and ComEd have a wealth of energy efficiency programs that help families cut their energy use and save money on their power bills.